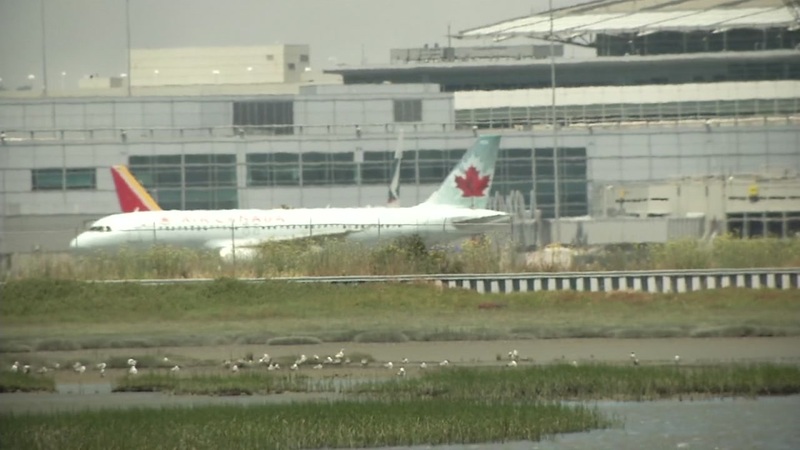 SAN FRANCISCO (KGO) -- The NTSB is now investigating an incident at SFO involving an Air Canada flight that nearly landed on a taxiway. The NTSB will interview air traffic controllers, and may interview the Air Canada pilots involved. The flight was cleared to land, but it appears the pilot was confused and nearly landed on the taxiway instead of one of the two runways. The FAA is now investigating the incident. Friday night at around 11:45 p.m., Air Canada 759 from Toronto was on the final approach to runway 28R. The SFO tower had given the pilot the all clear to land, but apparently the pilot appeared confused about the runway configuration. Below is a transcript of the conversation between the tower and pilots in the air and on the ground. AC759: "Tower, just want to confirm. This is Air Canada 759. We see lights on the runway there. Across the runway. Can you confirm are we cleared to land?" SFO TOWER: "Confirmed cleared to land. Runway 28 Right. There's no one on 2-8 Right but you." The sfo runway has a series of very bright lights which help identify the runway, never to be mistaken with a taxiway which has dim lights. As the pilot of the Air Canada plane appears to be moving toward the taxiway, another pilot alerts the tower. "Where's this guy going? He's on the taxiway," the other pilot said. That's when the SFO tower ordered Air Canada to abort the landing and go-around. SFO TOWER: "Air Canada, go around." AC759: "Going around. Air Canada 759." SFO TOWER: Air Canada looks like you were lined up for Charlie there. Fly heading 280. Climb maintain 3,000." AC759: "Heading 2-8-0, 3,000 Air Canada 759." As the Air Canada plane was climbing, the pilot of United Airlines flight 1 to Singapore which was taxiing to the runway for departure alerts the tower of the unusual move, twice. UA001 PILOT: "United One, Air Canada just flew directly over us." SFO TOWER: "Yeah, I saw that." Air Canada issued a statement Monday saying, "Air Canada flight AC759 from Toronto was preparing to land at SFO Friday night when the aircraft initiated a go-around. The aircraft landed normally without incident. We are still investigating the circumstances."